This miraculous muscle, with a myriad of interrelationships, lives on the front of either side of the spine, connecting T12 and L1-5 (our lowest-rib vertebra and all lumbar vertebrae) to a highpoint on the inside of our femur, or thigh bone. There are actually two psoas muscles; one on either side of the spine. While standing erect, walking or lunging, the extended psoas is about sixteen inches long, but while sitting, is shortened to half its length. Defined as a hip flexor, the psoas is so much more. When healthy and supple, the psoas acts as a pendulum, moving freely while walking, gracefully initiating each step, stimulating circulation of blood and fluids through musculature, viscera, and the spine, like an internal massage mechanism. When shortened or weakened, like most of them are, the psoas is unable to properly perform, and can alter many aspects of our wellbeing. 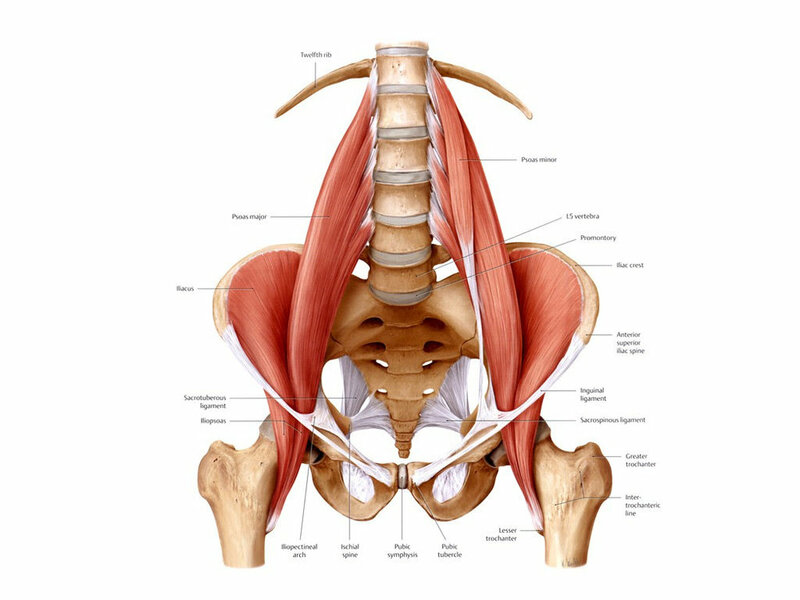 Interestingly, the psoas originates at T12, which is the same vertebra where the lower trapezius muscle of the back originates, causing these major muscles to influence one another, and their interconnected back, abdominal, hip, thigh and pelvic muscles. Common ailments attributed to a shortened or dysfunctional psoas include weakened erector muscles, kyphosis (hunching of the upper back), sciatic pain, bulging disks, lordosis (curvature of the lumbar spine), low back pain, tight hamstrings and quads, even neck pain. Releasing the psoas through gentle massage techniques, stretches and strengthening, can help with these symptoms. Consider the location of the psoas. Its length runs down the front sides of the spine, through the pelvis, and to the femur. It essentially lies beneath the digestive, urinary and reproductive systems. The T12 location where the psoas originates, known as the solar or celiac plexus, is a nerve plexus behind the stomach, distributing nerves to the viscera, or guts. Referred to as the 3rd chakra in Ayurvedic terms, this is an energy center responsible for self-empowerment and courage. The autonomic nervous system also runs down the inside of the spine and controls involuntary functions such as breathing, heartbeat, digestion, and the sympathetic nervous system, which activates fight or flight responses. Thus, an unhealthy psoas muscle can have farther-reaching ramifications than the aforementioned muscular pain. The dysfunctional, tight, bulky, or inactive psoas, rather than massaging and stimulating our organs and digestive tracts, can compress and misalign them, inhibiting abdominal, sexual, urinary, and digestive functions. Individuals who experience chronic constipation or a “weak” bladder might experience benefits to these conditions by having their psoas released. Freeing the psoas is also known to help enhance libido and endurance as it releases compression and adhesion of organs, and pressure on nerves, reducing stress and anxiety in general. Finally, the fear factor of the psoas. When people speak of their “gut” reaction, they are often addressing the complex chain of affects of the psoas and associated nerve fibers that communicate with the gut. Muscularly and neurologically, the psoas can hold many strong emotions. A tight psoas pulls us inward, like a baby in fetal position, a common protective posture. When we experience fear we close ourselves inwardly, and often do not release. According to Ayurvedic/yogic practice, when the solar plexus chakra center is inhibited, we can lack self-confidence, feel victimized, and withdraw. We can hold ourselves in this way for years, decades, unconsciously closing inward, as our psoas lacks circulation and constricts the nerves that activate healthy guttural function and stress responses, protectively guarding ourselves from the world. This may explain the release of emotions I have seen occasionally in clients when doing psoas work. Gently working toward achieving a healthy liberated psoas is beneficial to the entire muscular, visceral, spiritual and emotional being.